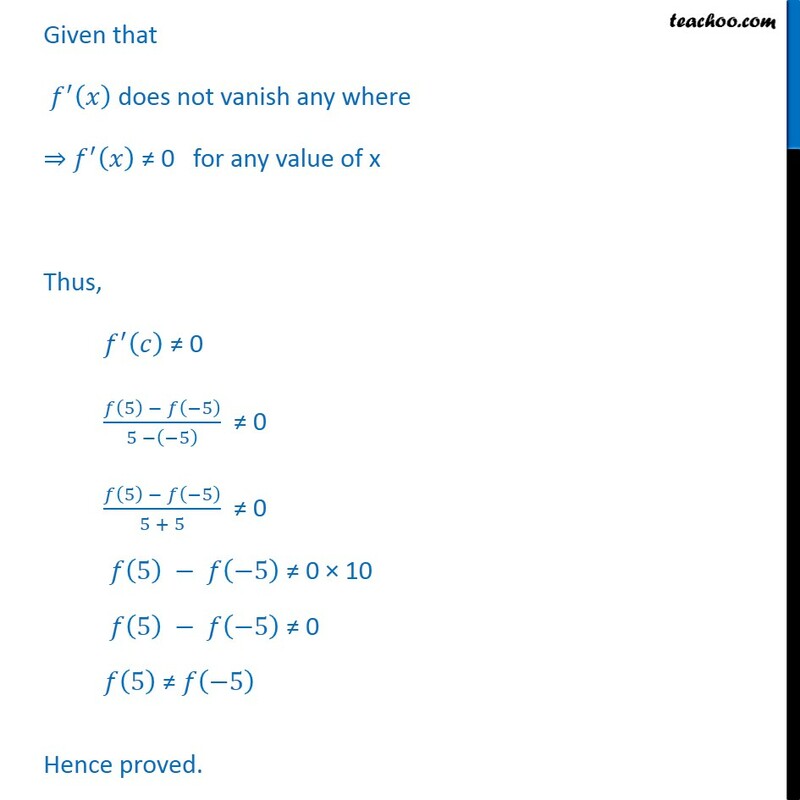 Ex 5.8, 3 If 𝑓 : [– 5, 5] → 𝐑 is a differentiable function and if 𝑓 ′(𝑥) does not vanish anywhere, then prove that 𝑓 (– 5) ≠ 𝑓 (5). 𝑓 : [– 5, 5] → 𝐑 is a differentiable ⇒ We know that every differentiable function is continuous. 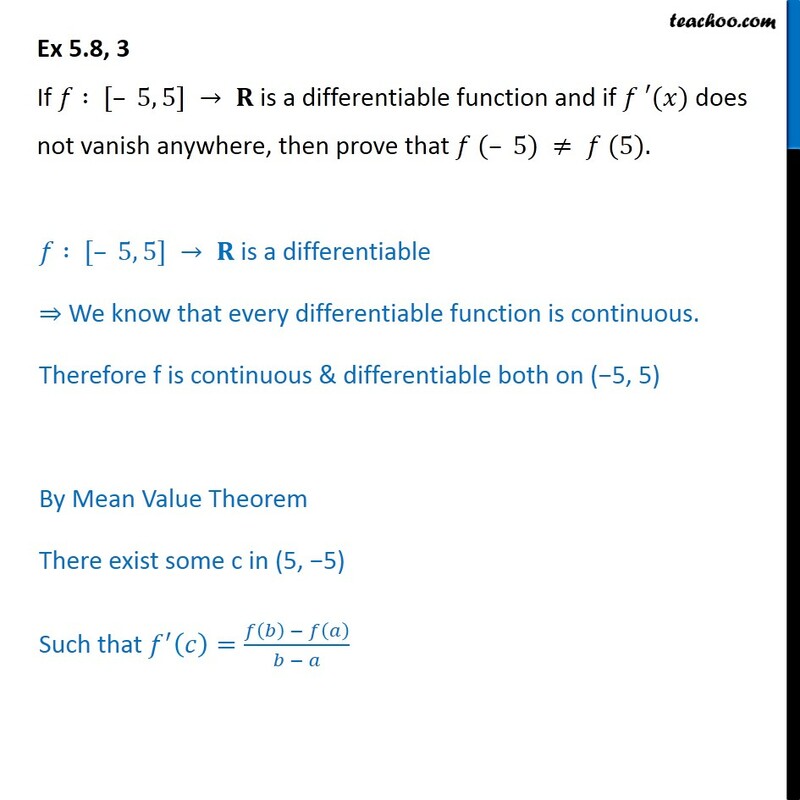 Therefore f is continuous & differentiable both on (−5, 5) By Mean Value Theorem There exist some c in (5, −5) Such that 𝑓﷮′﷯ 𝑐﷯= 𝑓 𝑏﷯ − 𝑓 𝑎﷯﷮𝑏 − 𝑎﷯ Given that 𝑓﷮′﷯ 𝑥﷯ does not vanish any where ⇒ 𝑓﷮′﷯ 𝑥﷯ ≠ 0 for any value of x Thus, 𝑓﷮′﷯ 𝑐﷯ ≠ 0 𝑓 5﷯ − 𝑓 −5﷯﷮5 − −5﷯﷯ ≠ 0 𝑓 5﷯ − 𝑓 −5﷯﷮5 + 5﷯ ≠ 0 𝑓 5﷯ − 𝑓 −5﷯ ≠ 0 × 10 𝑓 5﷯ − 𝑓 −5﷯ ≠ 0 𝑓 5﷯ ≠ 𝑓 −5﷯ Hence proved.